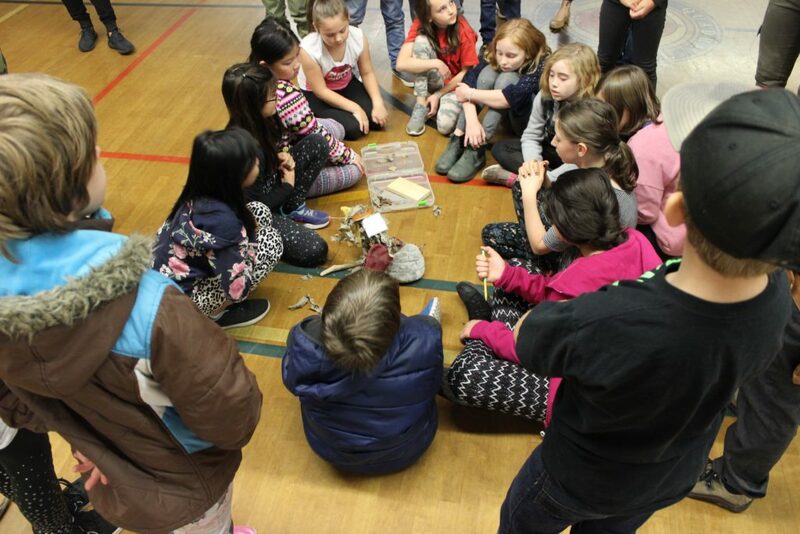 For the past 3 years, the AGGV has been co-facilitating fall workshops at elementary and middle school classes in the Greater Victoria area—even as far as Sooke—to bring students a morning of fun, exploration, and critical thinking, in conjunction with the Gallery’s Teacher Resource Guides. 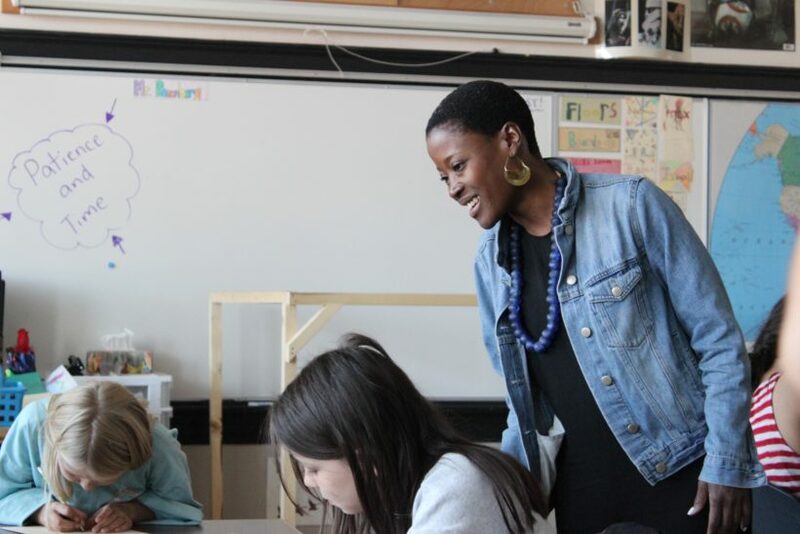 This year, Gallery and volunteer educators teamed up with guest artist, Kemi Craig (pictured above), to deliver hands-on, experiential learning that encouraged collaboration and honouring of Indigenous worldviews. Through several thought-provoking activities, this fall’s educational workshops centered around a key theme: art is open to interpretation. One activity involved examining works by Indigenous artist, Sonny Assu. Using photographs of the artist’s work, students explored a visual narrative with found object sculptures, an art form that involves finding (or buying) items that hold intrinsic value or meaning to the artist. Students were asked what they thought Assu’s pieces could represent. Answers ranged from “a piece of wood” to “a tunnel of light through the darkness”. After seeing examples, they were encouraged to create their very own found object sculptures out of a variety of items in a box – stuffed toys, egg cartons, string lights – the works. The second activity was equally hands-on. Using construction paper, students were encouraged to design and cut out a shape, and then give it a name, a superpower, and a weakness. The shapes were hung on clotheslines and projected onto a wall using flashlights in a dark room, creating a striking collaborative image. Many participants readily admitted that the powers and weaknesses they chose were derived from their own personality. Open discussion with the classes revealed that art is often an extension of ourselves. “The students really enjoyed both programs from the artists today and there was nothing but positive feedback! The students enjoyed the creativity of joining together collaboratively to create the found material sculptures and the moving sculptures. 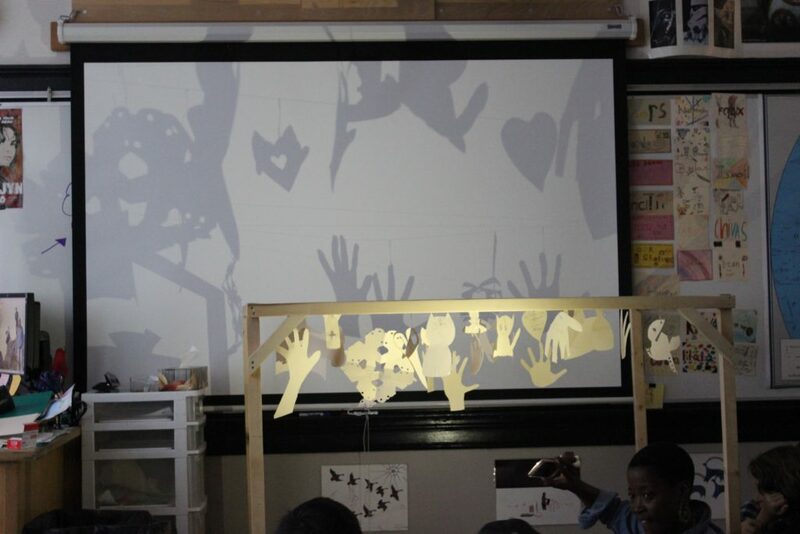 They loved the silhouette activity and the fact that they had a choice about developing their creations and of course that they got to talk about their own interests to create their own superpowers etc! They were amazed with the silhouette effects and so was I! I thought the activities really promoted creative thinking, choice, artistic awareness of perspective, and collaboration. Everyone did a great job today with their presentations! Thanks so much again!” Roberta Standley, a grade 3/4 teacher at Willway Elementary. Watch the video below for more insight! Video and photos by Katie McPherson. Edited by Naomi Kennedy, AGGV Guest Educator. Interested in experiencing a workshop next year? Please get in touch with us schoolprograms@aggv.ca . *Please note that workshops are offered October-November.